Well, we are living in a digitalized world. Starting from transfer of payments to booking tickets of transportation or movies, each and everything can be done though digital interface. And this is why the present Indian government is focused on bringing a complete digital modification in the banks and bank transfers as well. A huge number of implementations have already been done for the digitalization of banks. People are now using the digital payment gateways for the different services like online shopping, cabs, and even for the micro payments like the mobile recharges or paying of electricity bills can be done through digital payment methods. All this has been possible with the emergence of smartphones, internet connectivity and mobile applications in India. And this is why there has been the new emergence of e-wallets for the cashless payments. The RBI has announced for UPI which is going to be the game changer in the cashless mode of payments. So why was there a necessity of UPI? As we know, the banks have to deal with millions of money of different individuals. At present we have more than 10 million retailers and merchants. Among them only 6% are having the infrastructure of for accepting the card payments. So majority of transactions are taking place through cash. With so much cash inflow, it is really hard for the accountants to keep a track of the money and it even becomes difficult for tracking the taxes. This is where the importance of UPI lays. The government is focused on creating a mode of universal payment in India, which will create a cashless society. And this will also help the government in knowing the exact cash flow and taxes. How is the UPI better than the third party payments? 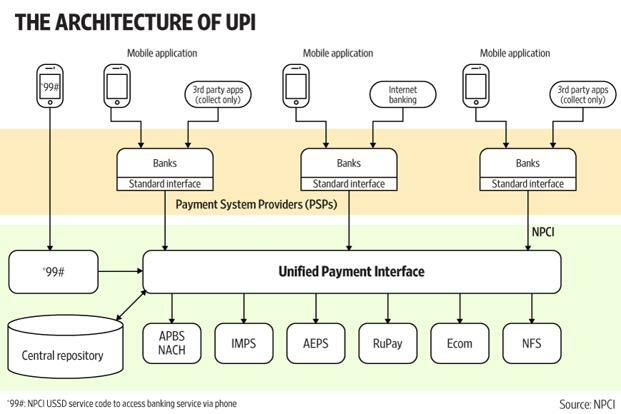 With the UPI application available on the smartphones, this will have a huge impact on the third party payment modes. Today, if you want to make online transfer of money, you have to add them as a beneficiary. And for that you have to get their details like, bank account number, address, branch name and the IFSC code. But the UPI app does not need any such documents. With the UPI application, only the mobile number will be needed for authenticating the transactions through a secure PIN number. Apart from the instant authentication facility, the UPI also offers ease of shopping even if you don’t have cash or credit cards at the moment. It has the facility of integrated payment system so that instant payments can be made to the merchants. The transfer of money through UPI can happen instantly. The UPI based transactions are also available on holidays, 24/7. You can transfer money from India to any other countries through UPI by using just the applications. Once you have downloaded the application you will need to select the amount of payment and the unique id of the beneficiary and click on send. After the password confirmation and your approval, the amount will be immediately transferred to the recipient bank. The UPI application is useful in making payments after receiving the gods. The buyer can send money by scanning the QR code or by entering the Unique ID of the company. This is a significant step for cashless economy. According to the statements made by the National Corporation of India, the UPI application shall be available within the next two-three days for customers to download and start using them. According to the reports, the Co-Founder of Infosys, Mr. Nandan Nilekani has been made the adviser of the UPI project that will be implemented really soon in India. Apart from that, few days back, it was Mr. Raghuram Rajan who implemented the new payment mechanism and since then UPI has been on a pilot run mode. The bank officials have reacted positively on BI’s command for implementing the UPI app. According to the Axis Bank head of the department, the Axis pay app will be the place where the UPI application will be available. If you are customer of the NPCI list of banks, then you will be able to make the transactions. The UPI is going to destroy the existing mobile wallets within India. Once the customer gets habituated with the fast IMPS based transactions depending on UPI payments the usage would become redundant. The major factor that needs to be checked is how the mobile wallets like Paytm, Mobikwik and Oxigen are going to react in this scenario. Recently Flipkart has acquired a set up for PhonePe that is making the solutions for Unified Payment interface. The UPI application is limited to android users till date and without the android users you will not be able to make use of it. Now the question that arises is, there are a huge number of people in India especially in the rural areas who do not have android smartphones. So how are they going to get the benefit of it? And another major thing is, the platform of this UPI application needs to be upgraded so that even the windows and iOS users are able to use the UPI application. A certain section of the country still uses normal digital smartphones and windows interface. So the government should also think about developing the application so that they are also able to use it.